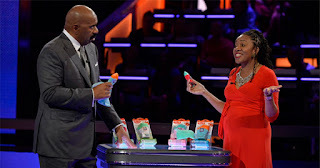 Mom inventor and co-founder of Darlyng & Co, Tara Darnley, is still in celebratory mode after winning $20,000 for her invention the Yummy Mitt Teething Mitten on Steve Harvey’s brand new funding show on ABC, Funderdome. The Yummy Mitt Teething mitten is designed for babies that teeth early and have limited fine motor skills to hold a traditional teether. Tara and her husband, Carl, came up with the idea after futile attempts to find a teether that their two month old could use. Her dexterity was not fully developed at such a young age, they desperately needed something she could easily self-soothe with, and nothing adequately met her needs. She naturally found comfort in chewing on her hands. This instantly sparked the idea of a teething mitten, she would not have to hold and they did not have to worry about any small choking parts. It would be manageable for her small hands to hold, soothe her inflamed gums and kept her hands busy and her happy. Steve Harvey's Funderdome is a seed-funding competition reality series where two budding entrepreneurs go head-to- head to win over a live studio audience to fund their ideas, products or companies.